The fish we call clownfish or anemonefish are well-known to non-hobbyists thanks to the popular film ‘Finding Nemo’. Even before the film was released, clownfish were among the most widely maintained marine fish, but the success of ‘Finding Nemo’ has meant that huge numbers of families have decided to set up a marine aquarium just so that their children can have a Nemo fish of their own -- despite the fact that the film was about the clownfish Nemo trying to escape from an aquarium and get back to his home in the sea! Although ‘Finding Nemo’ was about a wild-caught clownfish, most of the clownfish sold today are captive-bred, with by the most popular species being the False Percula Clownfish (Amphiprion ocellaris). Compared to wild-caught clownfish, farmed clownfish are much hardier, much less likely to be infected with the ‘clownfish disease’ Brooklynella, and invariably do perfectly well in aquaria without the need for an anemone. This latter point is crucial because maintenance of anemones is generally very difficult. Some expert fishkeepers simply regard large anemones like those used by clownfish as close to impossible animals to keep alive for anything like as long as they live in the wild. So while the sight of a clownfish nestling in the tentacles of a large anemone is certainly attractive, the reality is that this is something best observed on coral reefs while diving rather than in captivity. 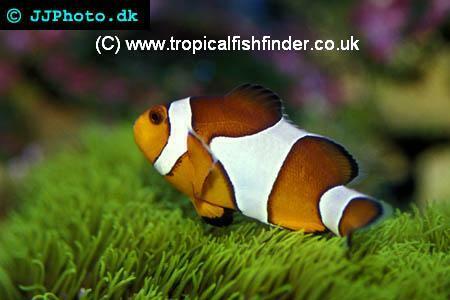 Ichthyologists currently recognise up to 29 clownfish species in two genera, Amphiprion and Premnas. 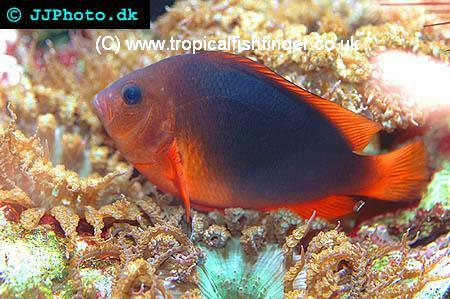 Although these are damselfish in the general sense, and so members of the damselfish family Pomacentridae, they are distinctive enough to be placed in their own subfamily, the Amphiprioninae. Clownfish are exclusively found in the Indo-West Pacific region, and are absent from the East Pacific (e.g., Hawaii) and the Atlantic Ocean (e.g., the Caribbean). There is only a single species in the genus Premnas, the Maroon Clownfish Premnas biaculeatus. 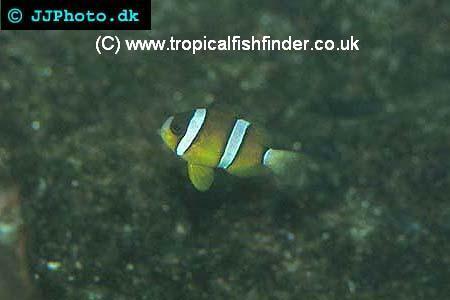 Among other traits, this species can be distinguished from the other clownfish (Amphiprion spp.) because only Premnas biaculeatus has what are called cheek spines between the eye and the base of the gill covers. All the other clownfish belong to the genus Amphiprion. Ichthyologists group them into four subgenera, Actinicola, Amphiprion, Paramphiprion and Phalerebus. These four subgenera approximate to the five species complexes recognised on the basis of similar colouration: Amphiprion (Actinicola) is the Percula Complex; Amphiprion (Amphiprion) contains both the Clarkii Complex and Tomato Complex; Amphiprion (Paramphiprion) is the Saddleback Complex; and Amphiprion (Phalerebus) is the Skunk Complex. While these species complexes may be unfamiliar to many aquarists, they are of some significance. Members of each species complex share behavioural traits as well as similar colouration, so it is easier to predict how a given species will behave in an aquarium if the behaviours of other members of that species complex are considered. Wild-caught clownfish experience tremendous mortality between capture and retailer, some estimates placing the mortality rate as high as 90%. Even when introduced to the home aquarium they rarely do well, and most are dead within a few months. The reasons for the enormously high mortality rate among wild-caught clownfish are not known for sure, but noted marine aquarist Bob Fenner has hypothesised that wild clownfish are first severely stressed by being pulled away from their host anemone and then further stressed by the rough handling the experience during shipping. Wild-caught clownfish are also very likely to be carrying the Brooklynella parasite. On the reef this parasite likely doesn’t exist in sufficient numbers to do much harm, but once the fish is stressed the parasite rapidly multiplies and spreads across the fish, eventually killing the fish. But whereas wild-caught clownfish are delicate and not worth buying, captive-bred clownfish are extremely hardy and very inexpensive. Many species are now bred on farms, including Amphiprion bicinctus, Amphiprion clarkii, Amphiprion ephippium, Amphiprion frenatus, Amphiprion melanopus, Amphiprion ocellaris, Amphiprion percula, Amphiprion perideraion, Amphiprion polymnus, Amphiprion rubrocinctus, Amphiprion sandaracinos, and Premnas biaculeatus. In short, practically every clownfish species aquarists are likely to want to keep are available in the trade as farmed fish, and without question these are the ones to buy. Most retailers stock only farmed clownfish, but it’s a good idea to check before purchase. As discussed elsewhere on Marine Fish Finder, the large anemones used by clownfish are generally difficult to keep and best avoided. A further complication is that not all anemones will be used by all clownfish, and the wrong combination can end up with the anemone damaging or eating the clownfish! Fortunately, farmed clownfish couldn’t care less about the presence or absence of an anemone, and in an aquarium nicely decorated with live rock and polyps the clownfish will be perfectly happy without an anemone. Clownfish are territorial by nature, and are best kept in situations where they’re free to be ‘top dog’. With that said, their territoriality is limited to a relatively small space and mostly directed towards similar-looking fish including clownfish and often damselfish. 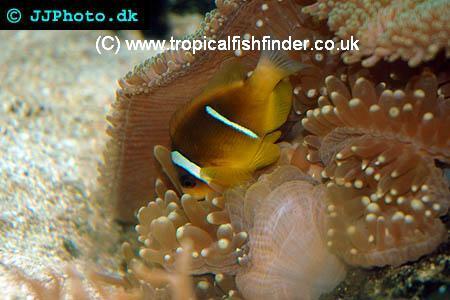 Given sufficient space, clownfish generally get along very well with dissimilar fish such as tangs and dwarf angelfish. On the other hand, clownfish are bite-sized prey for many large fish species. They should not be combined with lionfish, basses, groupers, large moray eels and so on. Territorial fish like angels, triggers and puffers will need to be appraised on a case-by-case basis, and given the size difference, the clownfish will need to be added to the aquarium first so that any larger fish accept them as part of the scenery rather than interlopers. Different clownfish species mix poorly, so it’s best to keep a single clownfish species per aquarium, otherwise the larger or more aggressive species will harass, stress, and potentially kill the weaker species. Singletons can do well, but clownfish may be kept in groups if they are reared together as juveniles. The reason for this is that clownfish are what are known as protandrous hermaphrodites. They are all immature males when young, and only the biggest and most dominant fish in the group matures into a female, and she only mates with the next biggest fish, the sole mature male. So if a group of two or more youngsters 3-4 cm long is purchased, these will mature into a dominant sexually-mature female, a sexually-mature male, and then any remaining fish remain sexually-immature, and usually physically smaller, males. Some species tolerate these immature males, while others drive them out of their territory, which in terms of fishkeeping will likely require that they are removed and rehomed. The captive-bred clownfish at least are hardy and adaptable by the standards of marine aquarium fish. A pair of False Percula Clownfish could be maintained in as little as 50 litres, though the larger the aquarium the better water conditions are likely to be, so an aquarium around the 100-litre mark should be considered the best starting point. Such an aquarium will provide ample space for the necessary live rock and will probably be sufficiently large a protein skimmer will be easier to install. While some hobbyists consider protein skimmers ‘optional’ pieces of hardware, they make a big difference when greedy fish like clownfish are being kept by removing organic waste directly from the water without raising nitrate and phosphate levels. This in turn minimises problems with water quality and can also reduce the rate at which unwanted algae can grow. Farmed clownfish will have been reared on prepared foods for almost their entire lives, so they are generally very easy to feed. Although wild clownfish rarely stray far from their host anemone, tank-bred clownfish suffer so such inhibitions and will dart about the aquarium to snap up food, even swimming up to the surface sometimes. A good diet would include a quality staple food as the staple together with periodic, at least weekly, offerings of wet-frozen or live foods to provide some indigestible matter that will help to avoid constipation and bloating. Although not essential, the use of a vitamin supplement is helpful. There are just two species currently placed in the Percula Complex, the True Percula Clownfish (Amphiprion ocellaris) and the False Percula Clownfish (Amphiprion percula). Both are relatively small species that get to about 8-10 cm in length. They share the same basic colouration of an orange body with three white bands, one behind the head, one halfway along the flank, and the third at the caudal peduncle. In theory, one way to tell them apart is to look at these white bands closely. On the True Percula Clownfish there are usually thick black margins to these bands, whereas on the False Percula Clownfish these black margins are either thin or absent. In practice though there are so many varieties of False Percula Clownfish bred on farms now that this difference in colouration isn’t necessarily reliable. Of the two species, the False Percula Clownfish is by far the more commonly sold, and it is frequently sold simply as the Percula Clownfish without any further qualification. One reason the False Percula Clownfish has become so popular in the hobby is that is a very hardy and tolerant species. It generally gets along well with its own kind, so maintaining this species in a large group as opposed to just a pair is usually possible. In the wild it is most often found living among carpet anemones (Stichodactyla gigantea and Stichodactyla mertensii) and the large anemone Heteractis magnifica. But farmed specimens happily live without an anemone. The True Percula Clownfish has similar requirements to the False Percula Clownfish, and can also be kept singly, in pairs, or in large groups. The Clarkii Complex is the largest of the species groups with at least ten members including Amphiprion akindynos, Amphiprion allardi, Amphiprion bicinctus, Amphiprion chagosensis, Amphiprion chrysogaster, Amphiprion chrysopterus, Amphiprion clarkii, Amphiprion fuscocaudatus, Amphiprion latifasciatus and Amphiprion tricinctus. Of these, Clark’s Clownfish (Amphiprion clarkii) is by far the most often seen. 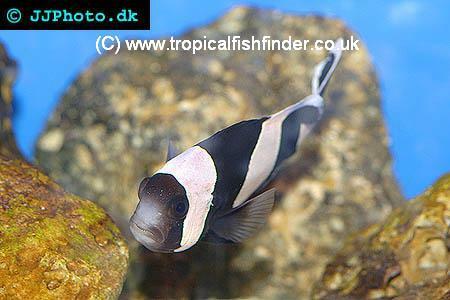 It is widely farmed and should be easy to obtain, even if it is bit less often traded than the False Percula Clownfish. On the whole Clarkii Complex are fairly large, up to 15 cm long, and tend to be highly territorial. They should be kept either singly or in pairs. Clark’s Clownfish in particular can become quite aggressive towards similar-looking fish. Because of their size these large clownfish need a fairly big aquarium, 180 litres in size or larger. Basic care is much like that of other clownfish but this species is notable for being a bit of a ‘wanderer’, often swimming farther from its territory that is usually the case with clownfish. In the wild host anemone species include Heteractis malu, Stichodactyla haddoni and Stichodactyla mertensii. Retailers frequently sell Clark’s Clownfish under another name, the Sebae Clownfish, even though that name properly belongs to a different -- and very rarely traded -- species, Amphiprion sebae. The Tomato Complex includes Amphiprion melanopus, Amphiprion ephippium, Amphiprion frenatus, Amphiprion mccullochi and Amphiprion rubrocinctus. These are big clownfish, up to 15 cm long, and typically a solid colour -- usually red or orange -- with a single white band behind the eye. The Tomato Clownfish (Amphiprion frenatus) is the most widely seen clownfish from this group. It is an aggressive species but very hardy and adaptable. 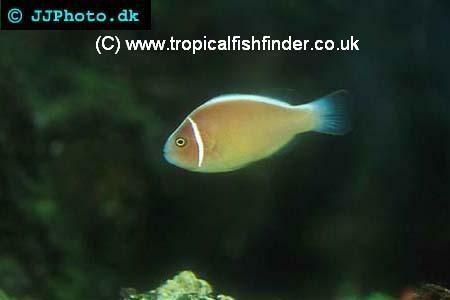 Except in the very largest aquaria the Tomato Clownfish is best kept either singly or as a mated pair. Like Clarkii Complex clownfish these clownfish need a large aquarium, 180 litres or bigger. Wild fish almost always inhabit the Bubble-tip Anemone (Entacmaea quadricolor). Occasionally other members of the Tomato Complex group are seen, including the Australian Clownfish (Amphiprion rubrocinctus) and the Fire Clownfish (Amphiprion ephippium). Maintenance of the other species is broadly similar to that of the Tomato Clownfish. Three species are placed in this group, Amphiprion latezonatus, Amphiprion polymnus and Amphiprion sebae. They are moderately large clownfish reaching around 12 cm in length. Body colouration tends to be fairly dark, and in some species at least the middle white band bends backwards to form a saddle-like marking along the dorsal surface. 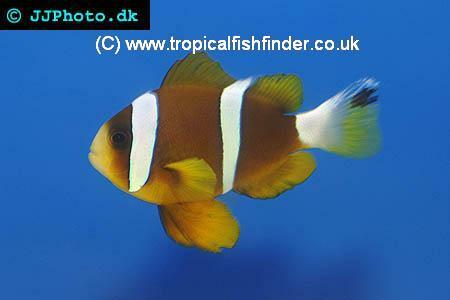 These clownfish are not widely traded and only the Saddleback Clownfish (Amphiprion polymnus) is regularly farmed. In the wild this species lives with several different anemones, most frequently Heteractis crispa, Stichodactyla haddoni and Macrodactyla doreensis. 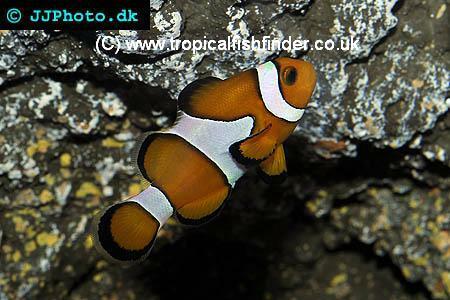 Saddleback Clownfish tend to be fairly aggressive and should be kept singly or in pairs. They need a fair amount of space and should not be kept in an aquarium smaller than 180 litres. Other species are only rarely traded, but their care is similar to that of the Saddleback Clownfish. Note however that the ‘Sebae Clownfish’ of the hobby is rarely Amphiprion sebae, and is usually Clark’s Clownfish (Amphiprion clarkii) instead. The Skunk Complex of clownfish species include Amphiprion akallopisos, Amphiprion leucokranos, Amphiprion nigripes, Amphiprion perideraion, Amphiprion sandaracinos and Amphiprion thiellei. They are named for the white stripe that runs along their backs. They are all middle-sized species that get to around 8-10 cm or so in length. The Pink Skunk Clownfish (Amphiprion periderion) and the Orange Skunk Clownfish (Amphiprion sandaracinos) are both widely traded. They are both fairly small (to 8 cm) and not particularly aggressive. Basic care is similar to Percula Complex clownfish, though a larger aquarium, 150 litres upwards, is required. Like Percula Complex clownfish, these two Skunk Complex clownfish may be kept in pairs or groups, depending on the size of the aquarium. The Maroon Clownfish is a distinctive species that gets much larger than any other clownfish, the females reaching up to 15 cm in length, the mature males being a bit smaller. Because they are very territorial and aggressive, they are normally kept singly, and they should never be combined with any of the other clownfish species. Even a single specimen will require at least 200 litres, and a mated pair will require 300 litres or more. These clownfish are large enough and aggressive enough to hold their own in semi-aggressive fish communities, though they also do well in reef tanks. In the wild their normal host is the Bubble-tip Anemone (Entacmaea quadricolor).